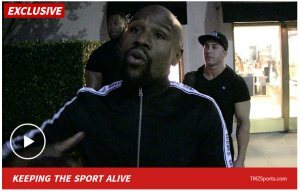 TMZ SPORTS -- Floyd Mayweather says he ain't done with Conor McGregor -- telling TMZ Sports he'll give the Irishman a rematch in the boxing ring right after he tunes up Khabib Nurmagomdov. "McGregor was talking that sh*t, so it ain't over," Floyd told us while shopping in Bev Hills this weekend. "After me and Khabib lock up, me and McGregor we gonna lock up again." As we previously reported, Floyd says he'll accept Khabib's challenge and will fight him in the boxing ring sometime in the near future, because it'll do "crazy numbers." Floyd says he expects to make a 9-figure check from the Khabib fight -- and a rematch with Conor could be just as successful. "I'm ready to go out there and get the job done and entertain. 'Cause me and McGregor Mayweather was real entertaining. I gave people what they wanted to see." Floyd also says his fights with UFC stars are helping the sport of MMA -- telling TMZ Sports, "I'm helping keep combat sports alive!" Of course, Conor and Floyd clashed back in August 2017 -- with Floyd dominating most of the fight and ultimately getting a TKO in the 10th round. Khabib says he'll fare better than Conor -- claiming he outstruck McGregor when they fought at UFC 229.